It would be a night of heavy losses for 419 Squadron, three crews lost on this one operation. Three airmen were killed while twelve became prisoners and six evaded capture. Five minutes later a second Ju88 attacked from dead astern, another corkscrew turn made the fighter loose it's target. According to Gibson another Ju88 attack occurred thirteen minutes later. This time from head on. The port wing along with the port inner engine were badly shot up and Stevenson called for the bail out. It was a good break for all the crew, they all had successfully evacuated the Lancaster. For Smith he mentions in interviews that that he had good landing. He hid his chute and got rid of his Smith and Wesson sidearm and moved off, not knowing where he was only a rough idea. After two days he made contact with the French Resistance. They hid him with a family in the village of Bercheres la Maingot. Where as he tells the story he spent the nights in the LeGrande family cupboard, along with a very large spider. After two weeks or more with the family he met "Janette" an operative dropped by the British. She was to aide in getting Allied airmen out of France, her real name was Ginette Jullian. The local people were making it difficult for the LeGrande family to keep Smith hidden any longer. Rumours were be passed around the village of a British officer at the LeGrande home. "Janette" made arrangements with the Resistance to move Smith to Spain via the Pyrenees. It was now mid-July and it was arranged that Smith be transported by car to Paris to have false documents made. Allan Smith in an interview a few years back mentioned the other passengers in the car were a Belgian traitor and his his girl friend. Along the way to Paris they picked another 419 Squadron evader Sgt. Dave High. They spend the night in Paris, feeling that things did not seem right. The next morning they were again in a car travelling to an unknown location when they ran into a road block. Smith felt that they were waiting for them. After first roughly removing them from the car, the German field police forced them back into the car with them and had it driven straight to Fresnes Prison. 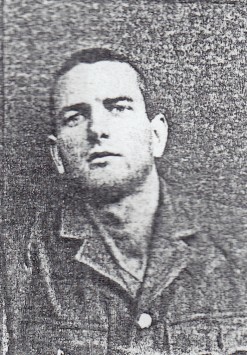 Smith mentions in his interview that Fresnes Prison was also called the "Gateway to the Concentration Camps". The filth and vermin of the prison were soon to be left behind. On August 15th. the Allied airmen all 168 of them along with all the other inmates of the prison were put on a train. The inmates were treated worse then cattle with hundreds being forced into rail cars designed for 40 men. And for five days they were in this "living hell" as Smith described it, until they arrived at Buchenwald. A Miracle and From An Unexpected Source..
As the days rolled on at Buchenwald and mass execution of Russian prisoners went on daily. Smith and the other Canadians knew that the date for their execution in a place where no one cared about the Geneva Convention or whole sale murder, was getting close. For some reason a group of Luftwaffe Officers were visiting the Concentration Camp. One of them as Smith tells, was a doctor who visited the camp hospital. It was here he found an Allied airman and became aware that there were many more here. The Luftwaffe Officers demanded the release of all the airmen. And they thankfully found support from high up in the Luftwaffe Command, Smith had a feeling it might have been Goering himself, the release of the airmen was arranged and they were on their way to Stalag Luft III. The date was October 20th. the day before the scheduled excution of the airmen. "So we got out of there and arrived at Stalag III. Now, that was a real Sunday school compared with Buchenwald." F/O Smith met and knew this Lady Spy code named "Janette" who was in reality Ginette Marie Helene Jullian. A French spy and wireless operator dropped into France the day after "D-Day" along with a colleague Gerard Dedieu. Ginette originally arrived in Britain in 1940 with her fianc� an airmen with the Free French Air Force. He was shot down in April of 1942 and held prisoner at Oflag XXI-B in Poland. Ginette then spent three months training as a pilot for the ATA. She was not accepted as a pilot. She then applied to SOE, Special Operations to be an agent. She was told she was not needed, but still with a desire to be of service she went to the French Intelligence Services for eights months. By 1944 she was with SOE, while noted as mentally stable they found she had a good Morse code ability and as someone put it, was keen on silent killing. An odd side of her quiet and shy nature. When Smith met her she was in the middle of a three month period of rebuilding a network of operatives. The original people she was to have contacted and joined were not to be found. Her new group was noted as quite good at harassing the enemy. She was recalled against her wishes to Britain. After the war she reunited with Philippe and moved to Tahiti. She died in 1962 in a diving accident, Philippe now a Vice Admiral died in 1986.